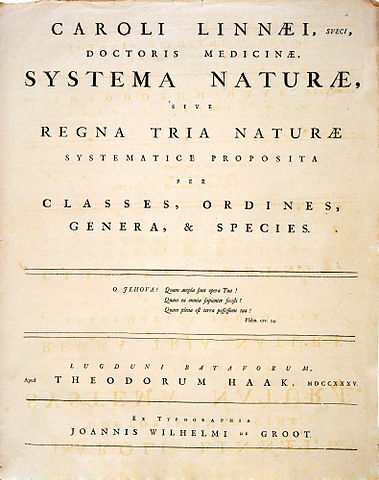 Cover of the first edition of Systema Naturae by Swedish botanist Carl Linnaeus published in 1735. This work introduced concepts such as binomial nomenclature, and is generally regarded as the origin of formal taxonomy. Image is public domain. If astronomers were to discover a new planet beyond Pluto, the news would make front pages around the world. Not so for the discovery that the living world is richer than earlier suspected, a fact of much greater import to humanity. There are currently 1.9 million species described on earth, most of which are invertebrates (~1.35 million), plants (~300,000 species) and fungi (~100,000 species). Perhaps somewhat surprisingly, only 65,000 or 3% of known species are chordates (the animals we are most familiar with including mammals, birds, reptiles, fish, and amphibians). The species scape: This image shows how diverse each major group of life is based on the size of the representative organism. 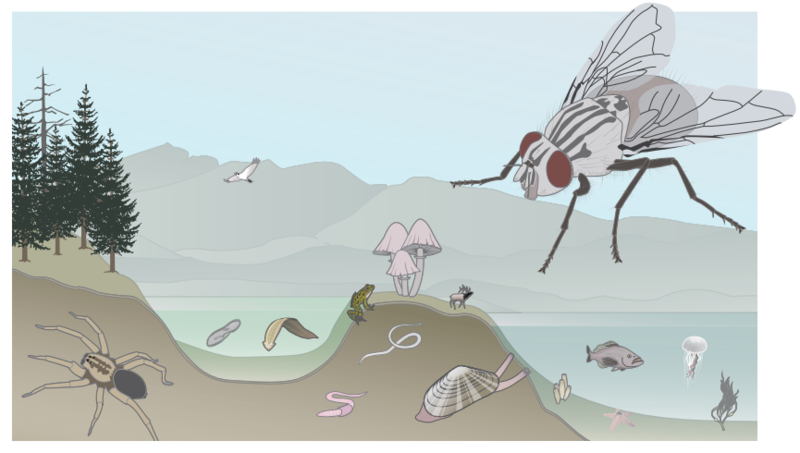 Note how insects (represented by the fly) loom over all other groups. This image uses numbers of currently described species. Original source free to be reused: yourwildlife.org/2016/09/updating-the-species-scape/. More interesting still is the total number of species predicted to share our planet. This elusive figure fluctuates between 5 and 50 million species depending on who you ask, but many recent estimates are in the ball park of 10 million species. This means 80% of species are unknown, and again, the vast majority of these are invertebrates, chiefly the insects. Most chordates have already been discovered and described. Taxonomy has a rich tradition and lofty goals. It is the biological discipline concerned with cataloguing Earth’s biodiversity, establishing how this biodiversity is related through shared common ancestry, and using this information to build a framework of classification for biodiversity both living and extinct. The Fauna of New Zealand series is a collection of taxonomic monographs describing and exploring NZ’s land invertebrates. 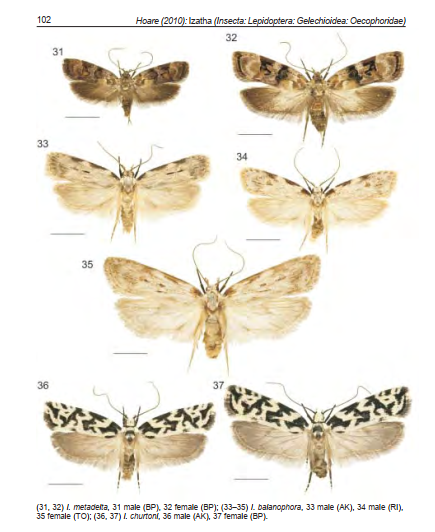 This is a page from Fauna of New Zealand 65 published in 2010, authored by lepidopterist (butterfly & moth specialist) Dr Robert Hoare, which focuses on lichen tuft moths (Genus Izatha). All Fauna of New Zealand volumes are available free online here. This kind of work cuts across boundaries between biological disciplines: for example evolution, comparative biology, biogeography, animal behaviour, genetics, biochemistry, morphology. All of these areas represent rich veins to be tapped by professional taxonomists who wish to integrate all available evidence into their study of biodiversity. When taxonomists describe or revise a species, they are comparing sets of characters between an unknown species and other closely related species. Characters may relate to physical form, behaviour, or even DNA. Because the techniques and technology available to taxonomists is always changing, species descriptions (and even how we define what species are) is in a state of flux. Taxonomists generally aim for monophyly: categorising species and higher-level groupings in a way which reflects evolutionary history, so that each clade contains only those species with a shared common ancestor. My first proper taste of taxonomy was when my masters supervisor, Dr Darren Ward, and I described a species of NZ parasitoid wasp. We decided to name it Lusius malfoyi after the Harry Potter character, mostly because we thought wasps got a bad rap and we wanted them to leave their bad reputation behind. I became passionate about supporting taxonomy during this process and I’m grateful for the experience. 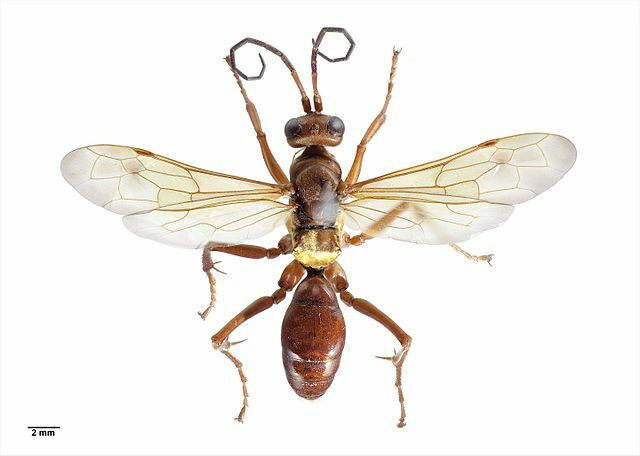 Sphictostethus nitidus, or the golden hunting wasp, is a species of spider-hunting wasp native to New Zealand. Detailed taxonomic studies often require access to specimens held in collections, such as this one, held at Auckland Museum. Image CC-BY 4.0. Why should we care about taxonomy? Without formal, accurate species descriptions based on good evidence we cannot ever hope to understand the biodiversity on the planet, including broad questions of how many species there are and what makes them tick. If we wish to conserve species or ecosystems which provide resources or ecosystem services crucial to our own survival then we must know what these species are, where they live, what they do, and we must be able to store, retrieve, and communicate information about them. If we wish to conserve or manage a particular species, we must be able to differentiate it from all other species. For example, official fishery data was masking the declines of several European species of skate because they were all being recorded together under only 2 species names when landed. National biosecurity relies on the diagnostic expertise of taxonomists to ensure pest species are accurately identified as soon as they enter a country, or as quickly as possible after an incursion. Nature provides the raw materials we need for food, fuel, fibre, and medicine. But what about the majority of species on this planet we don’t know about? How many of them are harbouring the next wonder drug or miracle material? 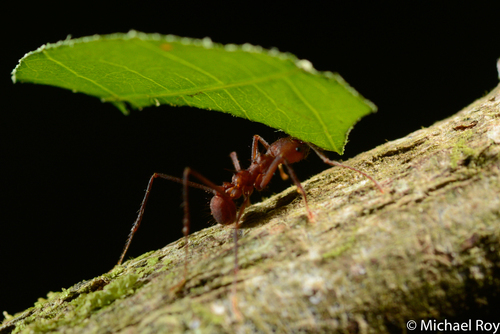 Discovering and describing species is the first step toward unlocking potential human uses. Natural selection has proven to be an innovative engineer in the way it shapes the bodies and behaviour of species. Human beings can tap into this repository of accumulated wisdom and apply the designs we see in nature to the technological and societal issues we are faced with. For example, take ‘biomimicry’ or the idea that humans can emulate the patterns or processes in nature to solve big problems. Humble Bee, a company founded by New Zealander Veronica Harwood-Stevenson, aims to develop a biodegradable plastic alternative based on the cellophane-like material native bees produce to line their nests. New Zealand has a legal responsibility to identify, monitor, and manage it’s biological diversity because it is a signatory to international conventions and treaties such as the UN Convention on Biological Diversity. 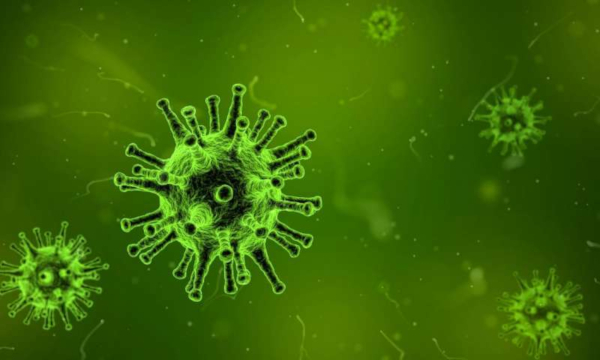 Viruses like this SARS coronavirus are kept in laboratory collections around the world to aid in swift diagnosis of new epidemics. Image is public domain. The decline of investment in taxonomy is a worldwide problem, described in reports from the secretariat of the UN Convention on Biological Diversity (2008), a UK House of Lords inquiry into systematic biology in the UK, and a follow up study by the Natural Environment Research Council. National taxonomic collections in New Zealand: A 2015 report published by the Royal Society of New Zealand, detailing the current state of taxonomic collections in New Zealand, and recommendations for the future. Click the image to go to the report. These issues surfaced recently with the news the Museum of New Zealand Te Papa Tongarewa was undergoing yet another restructure, and that specialist taxonomic jobs were on the line. Te Papa management wanted to axe the 5 collections manager roles, (currently occupied by people who are specialists in their field and internationally recognised experts) to be replaced by two assistant curators, two generalist collection managers, and a technician. The NZ Association of Scientists and Geologist Dr Nic Rawlence were among the people and groups concerned about what this would mean not just for access to the collections, but for Te Papa’s statutory obligations under the Act establishing it as New Zealand’s museum of national significance. A real sucession plan @Te_Papa would be to give Bruce Marshall a minimum of 3 years salary to properly train his understudy, so they get to know strengths & weaknesses of colln, & for Bruce to be able to impart his knowledge. 6 months is a joke & a slap in the face 10/n. Bruce Marshall, a mollusc expert who has described 450 species, and published over 120 journal articles during a long and productive career. Andrew Stewart, collection manager of fish since 1982, is also being made redundant. Andrew was one of the authors of the 4 volume, 2000 page bible of NZ fish published in late 2015, a text representing decades of experience and hard work. Phil Sirvid is a spider expert, an area identified in Te Papas own documents as a “key gap” needing to be filled. Antony Kusabs from the botany collection, and Tom Schultz who manages the marine mammal collection. Te Papa Tongarewa, the national museum of New Zealand, has a legal duty to safeguard its collections and make them accessible for research. Image: Wikipedia user JShook via Wikimedia Commons (CC-BY 2.5). The issues at Te Papa are symptomatic of taxonomy’s decline. To wrap up, I’ve briefly summarised a few of the challenges I can see facing taxonomists. 1. Ignorance of what taxonomy is, and what taxonomists do. How many of the decision-makers making hiring/firing decisions at museums, research institutes, or universities actually understand what taxonomists do, and how their work contributes to the biological sciences as a whole? Even in the scientific literature, taxonomy is often defined narrowly as merely ‘naming’ species. Similar is the view it is merely a service to ‘end users’ who use biological nomenclature, keys, identifications services for other work presumed to be more important. With the rise of molecular techniques, some people now believe you can describe a species with only a DNA sequence. But DNA is a single character, and without proper descriptions that integrate many sources of evidence, no one would be able to talk to each other about species in a meaningful way. New Zealand’s taxonomic institutions are severely underfunded. Core funding for CRIs hasn’t kept up with inflation or the rising costs of collection management and storage. For example, Landcare Research houses 5 collections of national significance but has not seen an increase in core funding since 2008. Within organisations, funding for species descriptions, revisions, and detailed monographs has been diverted to other areas. Few scholarships or grants are earmarked for descriptive taxonomy. It takes approximately 10-15 years to develop in-depth expertise in a particular area within taxonomy, so when jobs are cut we lose a significant investment already made into staff training, and of course the expertise accumulated by the staff member. Because a large portion of New Zealand’s biota is not found anywhere else in the world, anyone wanting to work in NZ needs to be trained on our local biodiversity. Also important is a researchers ability to interpret taxonomic data and ensure their institution is up to date with current taxonomic conventions and methods. Losing experienced staff has many unforeseen consequences. Universities are a primary pathway for taxonomic expertise, but specialised taxonomy courses have almost vanished entirely. This is because universities mostly respond to market forces and student demands when deciding which courses to offer, rather than the broader needs of science and society. Hiring and performance committees often make decisions based on publication metrics such as ‘impact factor’, a value attached to articles published in a journal signifying the average number of times other people have cited an article from that journal in the last few years. Many researchers use taxonomic outputs without citing the most relevant taxonomic journal articles. This is why taxonomy journals tend to have very low impact factors, which puts taxonomists at a disadvantage when these kinds of metrics are favoured by decision makers. CRIs and museums rely on an increasing number of retired taxonomists who donate their time because they are passionate about what they do. Most species have not yet been described, and in fact 70% of New Zealands arthropods are undescribed. There are millions of specimens representing thousands of species sitting in New Zealand collections awaiting taxonomic treatment. Less than 20% of NZ taxonomists are funded to spend at least half their time on taxonomic research (this figure is almost 50% in Canada). The demands on taxonomists have changed such that most professional taxonomists report they spend far less time on descriptive work than they would like to. Like any other profession, taxonomists spend a lot of time filling out paperwork, attending meetings, ticking off administrative tasks, complying with institutional processes, and also things like entering data into institutional and/or collaborative databases. Taxonomists have to spend time undoing the mistakes of past workers by revising species and higher groups which were inadequately described the first time round. There are even ‘taxonomic vandals’ such as Raymond Hoser who insists on publishing shoddy, erroneous descriptions of reptiles in a journal he started himself with no peer review. Pointing out the challenges is one thing, but I don’t feel confident or experienced enough to offer any serious solutions. But it is clear that taxonomy needs a facelift in the hearts and minds of the public, the scientific community, and the political classes if we’re going to see any movement in the right direction on these issues. 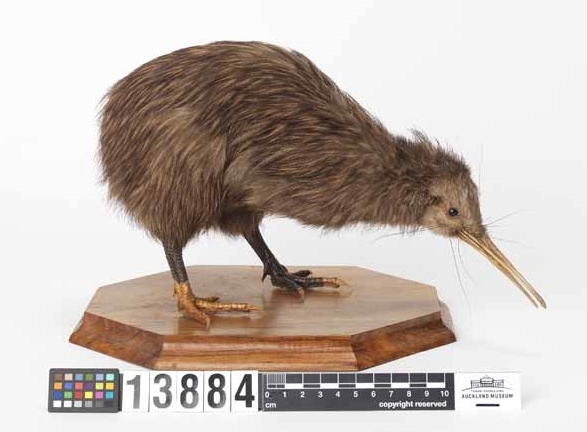 Apteryx mantelli, the North Island brown kiwi, from the Museum of Auckland. CC-BY 4.0.
de Carvalho et al. (2014). Does counting species count as taxonomy? On misrepresenting systematics, yet again. Cladistics, 30(3), 322–329. Chapman, A. D. (2009) Numbers of Living Species in Australia and the World. Report for the Australian Biological Resources Study. 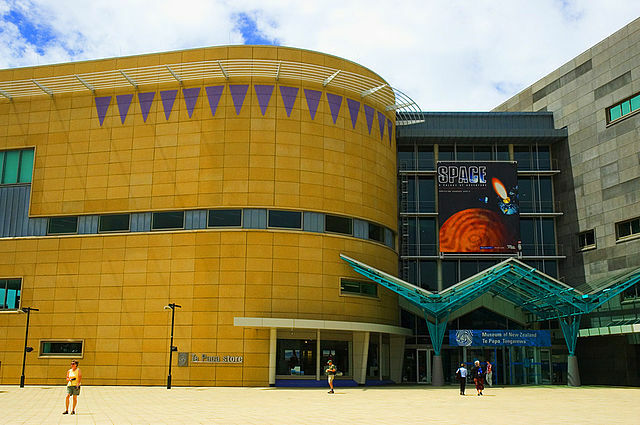 Macdonald, N. “Te Papa restructure risks loss of irreplaceable science expertise – critics.” Published Jan 26 2019. Stuff.co.nz. Nelson et al. 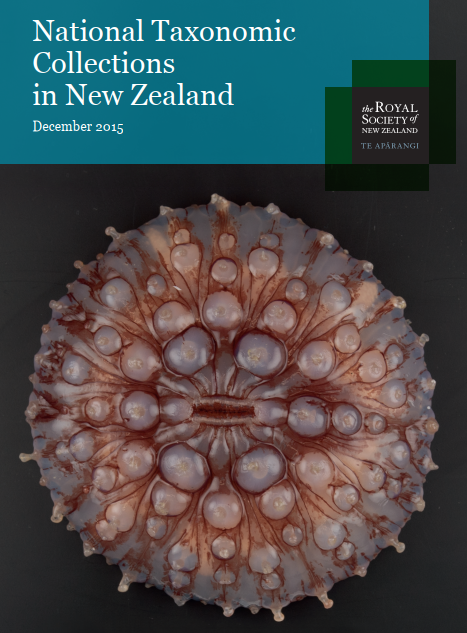 (2015) National taxonomic collections in New Zealand. Published by the Royal Society of New Zealand. Sluys, R. (2013). The unappreciated, fundamentally analytical nature of taxonomy and the implications for the inventory of biodiversity. Biodiversity and Conservation, 22(4), 1095–1105.